In a world that has turned to online for the media hub it is common to question direct mail in today’s virtual era. Contrary to what you may contemplate, direct mail is not only effective, it has an outstanding return on investment. Why is it so effective you ask? Here are five reasons why. It’s easy to miss or ignore an email or web ad. The big postcard in the mailbox customers have to physically touch is not as easy to overlook. Even if the mail piece is promptly discarded the viewer still had to acknowledge it. When done properly, a good direct mail piece will stand out in a crowded mailbox, grab the customer’s attention and entice them to act. 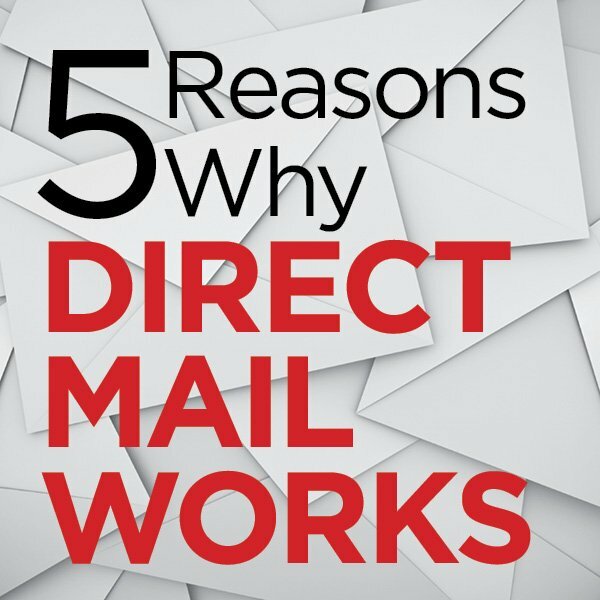 Direct mail delivers sensations that online activity can’t. You can feel a mail piece in your hands. You can hear an envelope or tab tear open. You might even be able to smell it. Websites and e-mail cannot compare to this experience. If we do our jobs effectively, the piece will fully capture their attention. Direct mail has the advantage to target your market — not only with lists, but with variable messages. You can tailor your direct mail design to different lists — best customers, lapsed customers, even prospects. The more targeted the message and the list, the better the response. In fact, if you’re not customizing your print products, you may be wasting your efforts and creating “junk mail” that won’t get noticed. Direct mail doesn’t have to be solely about getting a sale. For instance, a sweet “thank you” mailing on quality paper can make your customer feel special and consequently have a deeper connection with your company. Try sending this to your best customer segment to significantly add sales without overly promoting a sale. Direct mail should be one of many pieces in your marketing strategy. Build your marketing plan with direct mail as a component. Use e-mail to pre-announce mailings or to remind customers of an expiring offer and to push traffic to your website for convenient ordering. Let the marketing and design staff at Mitchell Graphics assist with your direct mail project.